Put the chicken breasts in a shallow glass or ceramic dish. Pour 1 1/2 cups maple syrup marinadeover the chicken, turning to coat. Cover and refrigerate for at least 4 hours and as long as 24 hours. Refrigerate the remaining 1/4 cup of marinade. Prepare a charcoal or gas grill. Lightly spray the grill rack with vegetable oil cooking spray. The coals should be moderately hot. Put the apple rings on a plate or baking sheet and brush on both sides with the remaining 1/4 cup marinade. Set aside at room temperature to marinade while grilling the chicken. Lift the chicken from the marinade, reserving the marinade. 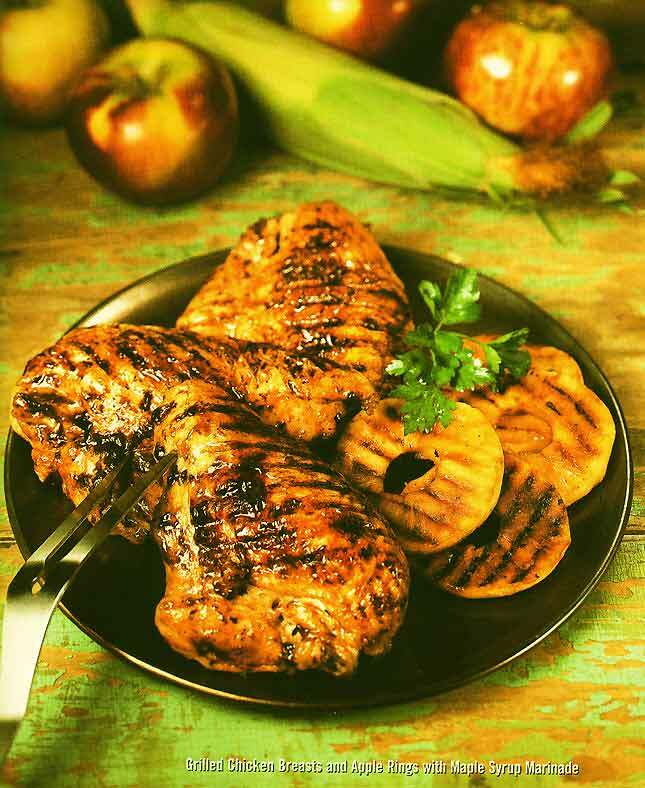 Grill the chicken breasts skin side down, for 25 to 30 minutes, turning with tongs frequently and brushing several times with any remaining marinade during the first 10 minutes of cooking. During the last 10 minutes of grilling, place the apple rings on the outer edge of the grill. Brush with some oil and grill for about 5 minutes. Turn, brush with some more oil and grill for about 5 minutes longer, or until lightly browned on both sides and tender. The chicken is done when the juices run clear when the thickest sections are pierced with a fork, or when an instant-read thermometer (don’t touch the bone) inserted into the thickest part of the breast registers 170 F. Serve immediately with the apple slices. Real maple syrup gives this fruity marinade just the right sweetness it needs to enhance chicken. Whisk together all the ingredients in a glass or ceramic bowl until blended. Adjust the seasoning with pepper. Use according to the recipe, or cover and refrigerate for as long as 2 days.